The first Rice University shuttle full of new Owls arrived on campus Aug. 12 ahead of the sun. At 6:30 a.m., a group of 15 international students from Denmark, France, China and Singapore stepped off outside Duncan College. O-Week had officially begun. Each incoming class of freshmen begins its Rice experience with a weeklong orientation, O-Week for short, that introduces the new students to the campus, culture, colleges and their classmates. 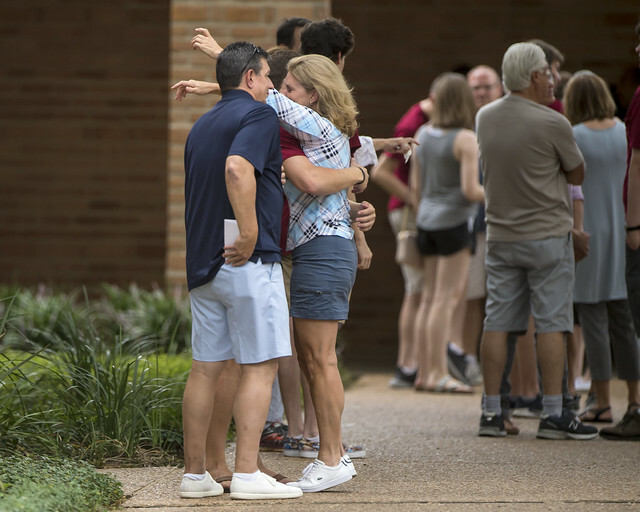 Registering for classes and learning about policies is only part of the O-Week package; what makes an Owl orientation truly special is the friendly greeting by upperclassmen who wait at each residential college to greet arriving freshmen and their families with chants, cheers and a helping hand. “All the planning we’ve done since November is coming to fruition,” said Duncan junior Louis Cole, one of the many O-Week coordinators who spend months planning themes and events for the incoming freshmen and memorizing their names, hometowns, hobbies and other details. Making the new students feel at home and welcomed is their No. 1 goal, Cole said. Lovett sophomore Nimisha Krishnaswamy stood nearby with fellow sophomores Kelly Park and Sarah Kim, holding signs and cheering loudly as each incoming Owl arrived. Last year, Krishnaswamy made a 24-hour journey from India to begin her studies at Rice and remembers feeling immediately embraced by her fellow students. “It’s nice to give them the same warm welcome so they feel at home,” she said. Inside Duncan Commons, Monya Singh smiled as she watched her son, Mantej, join a queue of students lined up to receive room keys, O-Week T-shirts and other vital information. The Singhs arrived in Houston five days ago after a 22-hour flight from Singapore, finding the tropical weather familiar and the gregarious greeting as anticipated. The Singh family learned about Rice from a former classmate, but a visit to the campus sealed the deal for Mantej. Outside Martel College, the Castillo family arrived in a truck packed with both family and furniture for their son Ace, the first of their children to leave for college. Mom, dad, little brother and little sister had all joined the road trip from Corpus Christi to see off Ace, who was one of Texas’ top high school cross-country runners. Having already met his Rice track teammates and coaches, Ace was ready to tackle O-Week next. “It’s a lot of information being thrown at us but I’m ready to take it all in,” he said. The sun was shining over Wiess College by the time Chance Allshouse arrived with his family, father and Rice Board of Trustees member J.D. Bucky Allshouse ’71 and mother Cynthia. Bucky Allshouse, a former defensive back for the Rice football team and 1990 Rice Athletic Hall of Fame inductee, is known to erect a 14-foot-tall Rice Owls Christmas tree each year. “Rice has been my life,” said Allshouse. “It’s always been there for me.” That love for Rice has bloomed in his son, too. Inside a narrow stairway at Sid Richardson College, a red-shirted O-Week welcome crew worked with cheerful efficiency to move suitcases and small refrigerators from the trunks of arriving cars and into the commons for transport up to the students’ rooms. Sid Rich junior and O-Week coordinator Chris Yum directed traffic with sunny energy and a smile for each new face that flew past. During a brief pause in the midst of the commotion, the Sid Rich senator explained why O-Week was so important to both him and to the students he was welcoming to their new home.